Microsoft recently opened the last building in a multibillion-dollar campus expansion announced a decade ago. Now, as it looks ahead to future building, it has received a zoning change that would allow taller buildings in the future. 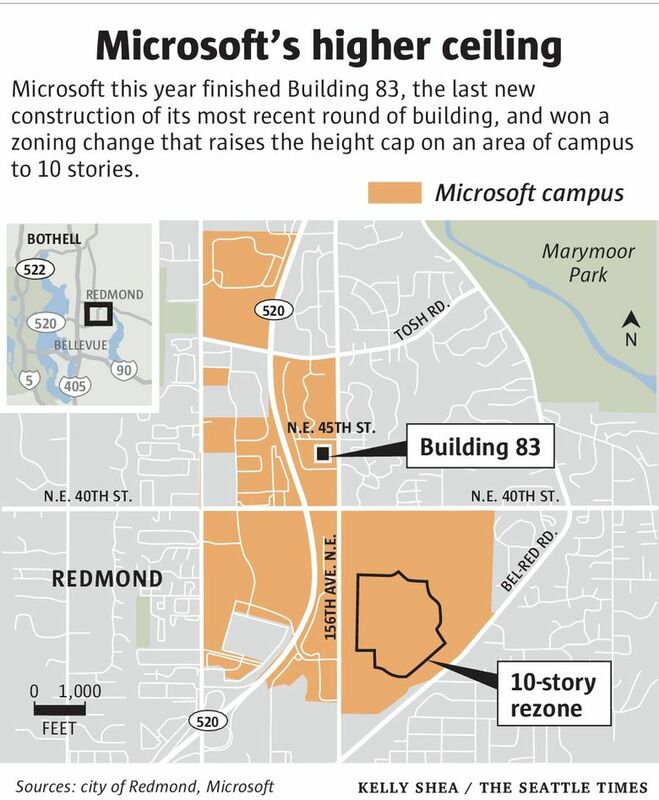 Microsoft spent much of the past decade growing horizontally across its Redmond campus, constructing or buying 14 buildings. The next step may be growing upward. The company in February quietly won approval from the city of Redmond for a zoning change that allows structures up to 10 stories tall on a portion of the eastern half of Microsoft’s campus. The tallest buildings currently on campus are six stories, and the height limit for most of Microsoft’s campus is five. Microsoft says it has no plans to start any construction soon, and city officials say they haven’t received any requests for permits for new building or renovations. 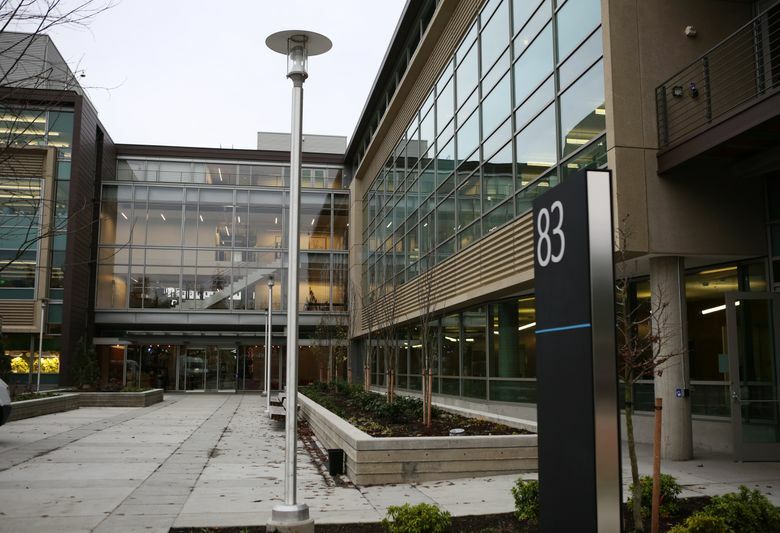 The expanded height ceiling gives the company another option as it weighs redevelopment of the core of its Redmond campus, company officials told the city. The zoning change comes as the company puts the finishing touches on Building 83, the last new building constructed as part of a multibillion-dollar expansion announced nearly a decade ago. That expansion took the company’s roughly 500-acre campus to 10 million square feet of office space — home to most of the company’s 43,000 employees in Washington state. 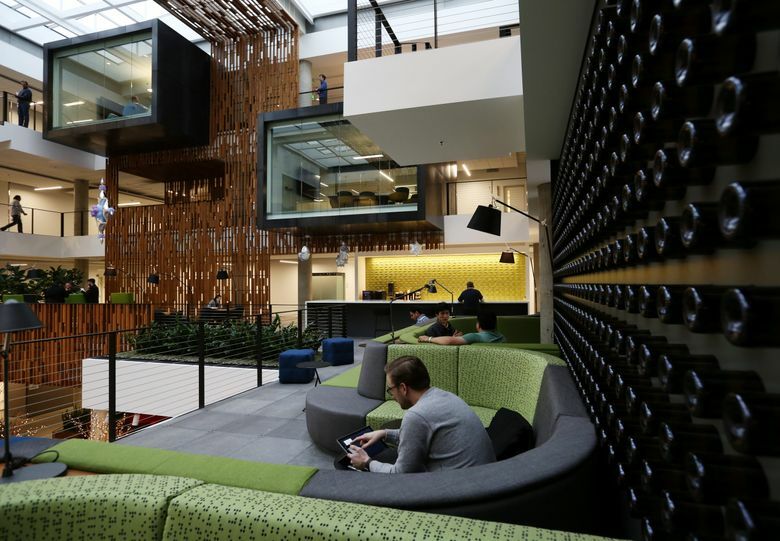 The new height limit is the latest sign of a rethinking of corporate workplaces that has already reshaped Microsoft’s facilities. Workers’ tastes have shifted from private offices in suburban office parks to open floor plans with meeting nooks, dining options, and other perks that feel more urban. Microsoft last year hired San Francisco architectural firm Skidmore, Owings and Merrill to study plans for the campus, talking to business leaders and employees to determine a plan for future development, Microsoft real-estate officials told Redmond’s planning commission. The commission approved Microsoft’s request to increase the building height limit for a portion of the campus east of Highway 520 that includes some of Microsoft’s oldest buildings. That area, Microsoft said, is the portion of campus most likely to be redeveloped in the future. A Microsoft spokesman said the work with Skidmore was no longer ongoing. Bloomberg News reported the firm’s hiring earlier this year. A decade ago, Microsoft’s future in Redmond wasn’t so certain. Amid worries about development limits in Redmond, Microsoft scooped up about 150 acres in Issaquah, opening up the potential for a rival campus. Meanwhile, Microsoft was hiring rapidly at research and sales outposts around the U.S. and abroad. The company doubled down on its hometown starting in 2005, inking a pair of 20-year development agreements that set the terms for potential expansion of more than 2 million square feet of office space. Deals to buy land from Safeco, Eddie Bauer and Nintendo added more development room. Suddenly, Odle’s office was processing applications for millions of square feet of projects. The billion-dollar expansion would add space for 12,000 workers. As that building was under way, the company became one of the anchor tenants in a downtown Bellevue building boom. “They grew so fast, it was easier to lease than build at that point,” Redmond’s Marchione said. Microsoft has grown its head count in Washington state during the past decade by more than 40 percent, to 42,991 as of the end of September. During the same period, Microsoft’s overall head count rose by 90 percent. Most of Microsoft’s workers in the Puget Sound region are on the Redmond campus, with others in leased space in downtown Bellevue and the Eastgate area, as well as in smaller satellite offices in Issaquah and Seattle. Microsoft has been indecisive about the scope of its Bellevue footprint recently, deciding earlier this year to sublease 167,000 square feet of a Bravern tower in Bellevue before reconsidering and keeping its lease. Where the company goes from here is unclear, and representatives wouldn’t comment on future plans other than to say the company frequently evaluates its real-estate needs. The development agreement with Redmond allows Microsoft to build 1.4 million more square feet. Microsoft, company real-estate officials told the city of Redmond in September 2014, wasn’t in the middle of a growth cycle, giving the company time to develop plans. Microsoft has undertaken at least three rounds of layoffs during the past year, said to total more than 9,000 employees globally. Most of those cuts appear to have fallen outside of Puget Sound. At about 43,000 employees, Microsoft head count in Washington is about as large as it has ever been. A local real-estate-industry source, speaking on the condition of anonymity, said the company had indicated recently that its current level of office space was adequate for its head count and immediate needs. That resulted partly from the completion of Building 83, now home to more than 1,000 workers, including some in Microsoft’s Windows team. Workers had just finished the structure’s underground parking garage when the 2008 recession spurred cost cuts and Microsoft’s first-ever companywide layoffs. The building was mothballed. Construction resumed last year and was completed in September, a quiet milestone in Microsoft’s decade of development. 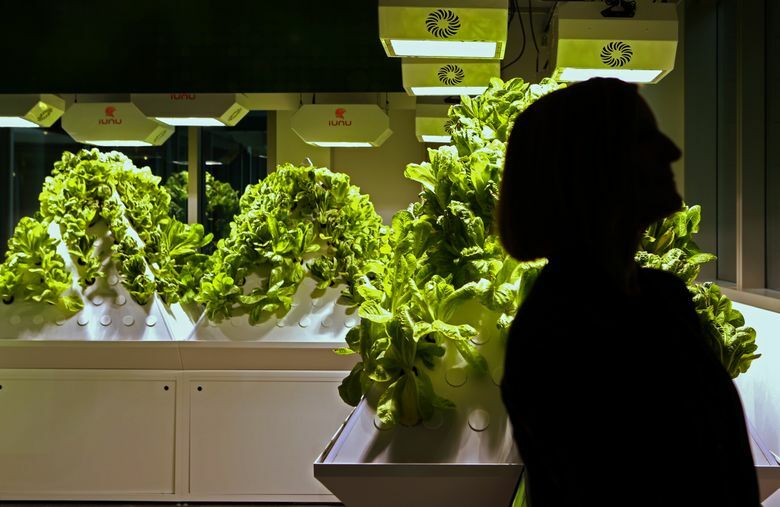 A recent tour of the 313,790-square-foot facility showed off some of the ways Microsoft’s thinking about its campus has changed over the years. Private offices largely have been replaced by open floor plans and small meeting areas. An open atrium extends from the lobby to the four-story building’s ceiling. The levels on the way up feature casual meeting spaces, including one designed to resemble a rooftop bar, as well as glass-walled conference rooms, kitchen nooks and standing bars to rest laptops or charge a cellphone. The original plan, drawn up before the recession, called for a ring of balconies that didn’t have those mixed work spaces. And eat. The company has redesigned cafeterias across campus in a rolling renovation program, inviting in restaurants, from espresso bars to pizzerias, Indian kitchens and barbecue joints. The most recent, a restaurant from award-winning chef Maria Hines, will be the only place on campus with a liquor license. Building 83’s edges are filled with clusters of desks called neighborhoods, which house teams of workers. Clarkson said groups get the opportunity to set their own workspace desk layout before moving in. 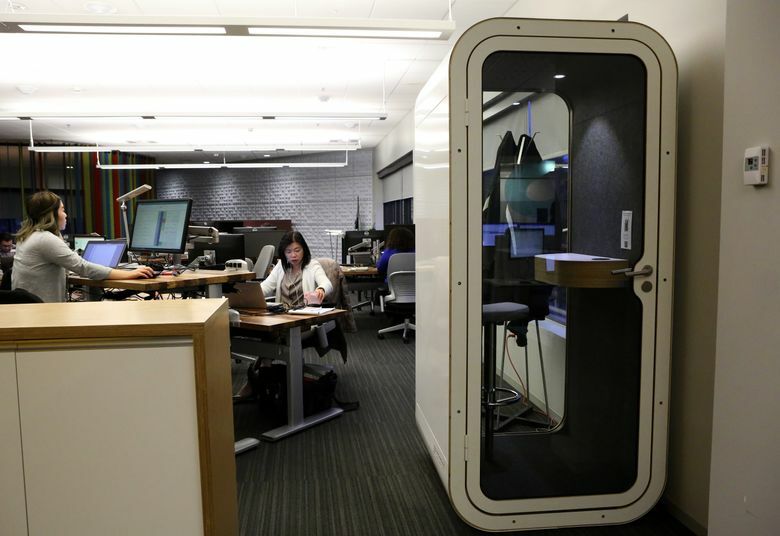 For a cluster of workers in Microsoft’s Cloud and Enterprise group, residents of a 25-year-old building recently renovated as part of a rolling remodeling program, that means stencils of ninjas on the walls and chalk drawings on a concrete pillar. 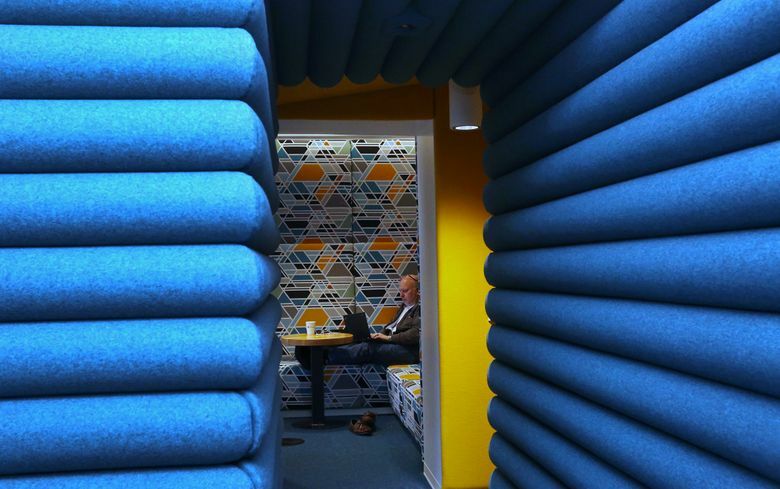 When it comes to their workspaces, “Why not let them decide?” Clarkson said. Information in this article, originally published Dec. 28, 2015, was corrected Dec. 28, 2015. A previous version of this story incorrectly stated that the new restaurant from chef Maria Hines would be the first on Microsoft’s Redmond campus to have a liquor license.